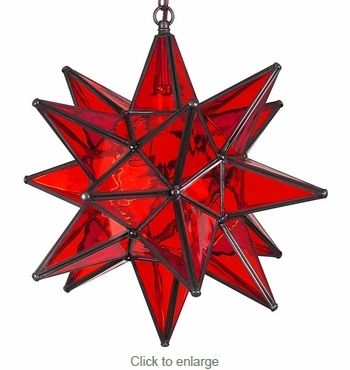 This red colored glass Mexican star light is a wonderful way to update your interior light fixtures and add a warm glow to your home. These celestial star lanterns are taken from the Moravian tradition and were used as Christmas decorations as early as the 1800s. Now, they make beautiful and elegant additions to rustic, Tuscan, or Santa Fe style decor year round. These glass hanging star lights are handcrafted in Mexico by talented artisans.